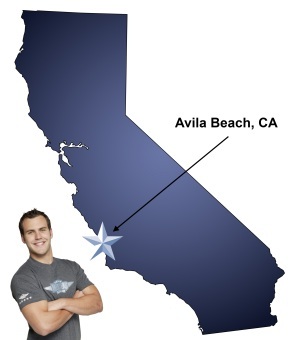 Meathead Movers is here to take care of the heavy lifting for you on your move to Avila Beach. Our clean-cut student athlete movers are ready to get you safely settled into your new Avila Beach home. Avila Beach is one of the most beautiful little beach towns in the world. The entire Central Coast can be surrounded by fog or clouds, but somehow the sun is always shining in Avila. The need for Avila Beach Movers is understandable as the stunning little town is a wonderful place to live. You can spend your days basking in the sun, playing golf at Avila Beach Golf Resort, wine tasting, or riding your bike out to Port San Luis to check out the seals who have taken up residence by the pier. Avila Beach is also a favorite spot for local families to bring their children to play because the smaller waves are muted by the large breakwater just to the north. After the late 1990s “cleanup”, where decades of oil seepage from deteriorated pipes and storage containers were removed forcing the tear down of all the downtown buildings, almost the entire town has since been rebuilt. The residents and architects worked hard to successfully keep the same quaint beach town atmosphere that Avila is known for, and as a result Avila Beach is even more charming than before. Whether you are moving to Avila Beach because you are retiring to Pelican Point or if you’ve bought one of the amazing mansions at the top of the hill, your relocation will go smoothly with Meathead Movers. Our knowledgeable Move Coordinators will customize our moving services specific to your needs and come move day you will be thrilled by the award-winning customer service delivered by our student-athlete movers. Whether you need local, long-distance, or commercial moving services, packing and storage services, or even help finding service providers in your area, we and our moving concierge service are here to help you! Give us a call today for a free moving quote. With our 100% satisfaction guarantee, the only thing you have to lose is the stress that comes from moving! Moving to Avila Beach? Here are some helpful resources. View more Avila Beach resources. Positive attitude and desire to care for items. Your team always shows up on time and with the most positive and professional attitudes. You get your money's worth with Meathead Movers! As always they were professional and courteous and extremely patient as our products arrived much later than we had been informed. The movers are polite, personable and very capable. They work hard and efficiently.